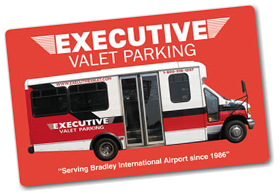 If you travel regularly or require long term parking for Bradley International Airport then our prepaid cards are the best deal you will find! For frequent short stay fliers prepaid cards are a great way to save and a more convenient way to purchase parking compared to making multiple transactions. Prepaid parking is now available for $7.95 a day with a minimum 10 day purchase. Our regular posted rate is $12.95 a day. Prepaid parking cards are reusable, transferable, and never expire! If you travel frequently and need flexibility but want to save money, then this is the product for you. These cards are good for single or multiple days of parking. *Prices are subject to CT Sales Tax and Airport Access Fee. SAVE WITH OUR PREPAID CARDS — ONLY $7.95 A DAY!